The 2018 Nutrition Kitchen schedule saw Art Green and other nutrition gurus, including our official nutrition coach, Simone Olivia, prepare and cook some of their favourite healthy dishes live – showing you how simple it is to cook nutritious and delicious meals at home! Simone demonstrated how to meal prep simple, nutritious meals as well as showcased a range of quick and easy breakfasts, snacks and smoothies. 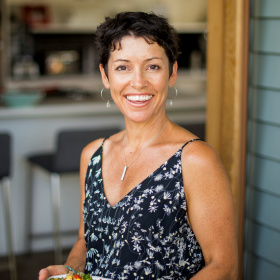 Simone is a holistic performance nutrition coach passionate about showing her clients how healthy eating strategies don't have to be uneventful and stressful, instead delicious and enjoyable. She specialises in fat loss, muscle gain, increasing energy, athletes, high performing athletes and high performing individuals. Art Green is an entrepreneur and health advocate. Art has a background in exercise physiology and his passion for health and nutrition has steered him into the health food industry. He’s a director of Riot Foods, the parent company of the brands CleanPaleo and Poppy & Olive – two fast-growing health food companies producing natural, whole-food products. I know that you’ll soon be passionate about your family’s mealtimes too! With over 6 million social media fans and counting, Gold Coast fitness sensation Ashy Bines took the Nutrition Kitchen by storm. Ashy Bines and gal pal Gretty Rose prepared some of their favourite dishes from their popular YouTube series ‘Kittens in the Kitchen’ live in the Nutrition Kitchen. Having put 200,000+ women through her Bikini Body Challenge and Clean Eating Diet Plan, Bines is somewhat of a fitness guru for young women. And one of her favourite methods to support and encourage her followers is via her ‘Kittens in the Kitchen’ segments. Kittens in the Kitchen was created out of the love that both Ashy and Gretty have for cooking and proving that some of the best healthy recipes are also simple to make and cost effective! Annelies has been working in the Nutrition and Fitness Industry for over 10 years! 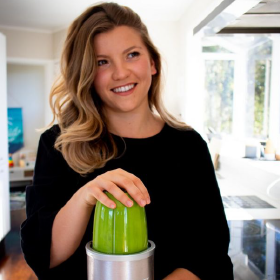 With a Bachelor of Human Nutrition and Sports and Exercise Science (Massey University) I SAK Level 2 (AUT), she is extremely passionate about helping others see the benefit of eating well and how small changes can make a difference to their well-being and lifestyle. She believes its all about creating healthy habits and not restrictions. 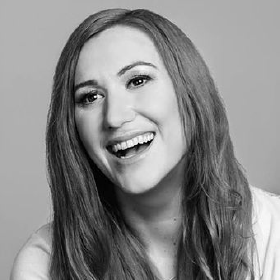 Danielle believes that no two people are the same, therefore an individualised approach is necessary for all. Danielle takes an evidence-based approach to nutrition, remaining up to date with all the latest trends and science and applying this to her day to day practice to ensure that her clients get the best advice. Certificate in Sport and Recreation Bachelor of Sport and Recreation and a Graduate Diploma in Holistic Nutrition (Holistic Performance nutrition).